Yes, Time Management is not just a anthromorphized artistic premise, he's also a muse, and not just any muse, the muse of Virmir Kendo of Crimson Flag Comic. Or just Virmir. Whether Virmir is his muse is up to debate. I had not really planned to have Virmir be TM. TM was just going to be a generic fox. But in time I noticed how well scheduled a certain fox was, so when I sat down to do a final design for TM...it came out a dash familiar. 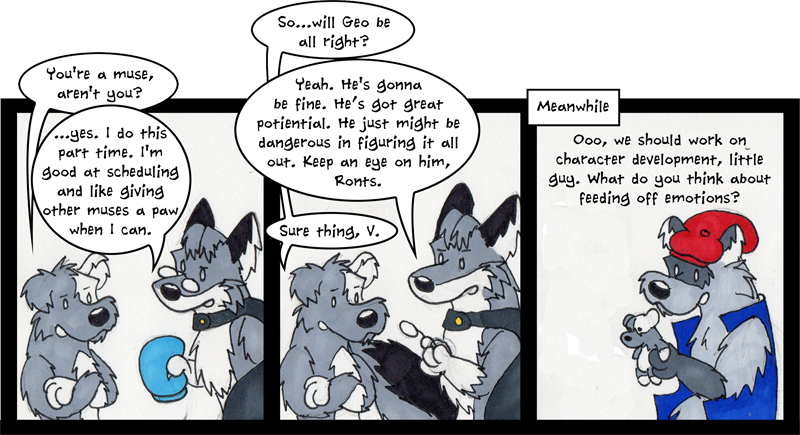 Also, I figured he deserved it because without him, I'm certain this little webcomic adventure would have never gotten past strip one (and if it had, it wouldn't have had half as nice a designed website or hosting service). Thanks again Virmir, for all the help and support in this project. Does this mean that other characters will be based off characters I know? Urm...doubtful. I don't think I know anyone who incarnates any other intangible premises as well as Virmir did TM...but I suppose only time will tell.